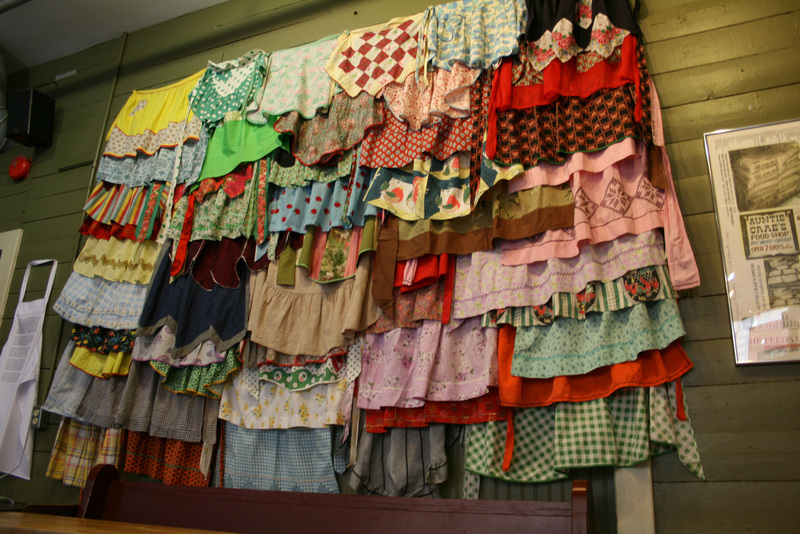 For over three years Hall collected used aprons as the “material” for this large scale installation project, intended to investigate and honor “women’s work”, both domestic and industrial. 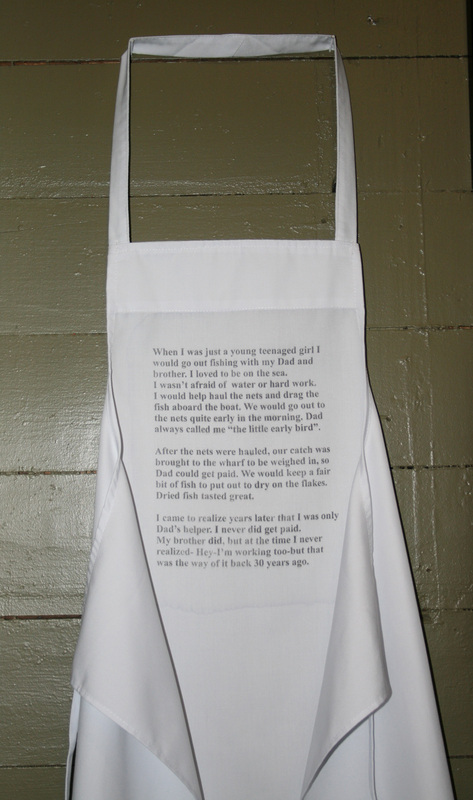 In Newfoundland, aprons have been installed to explore the work of women in the fishery, both past and present, to mark female labour “in the garden”, and various other forms of “housework”. 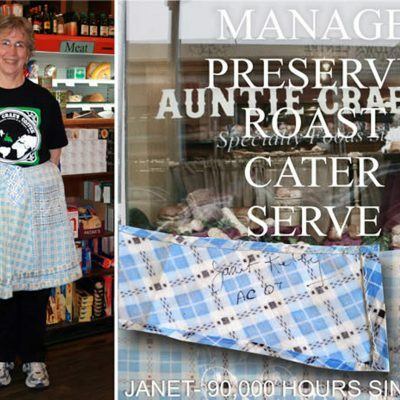 In 2007, the work of women at Auntie Crae’s – a 30-year-old bakery and specialty food shop, formed the basis for the first indoor iteration of the project. 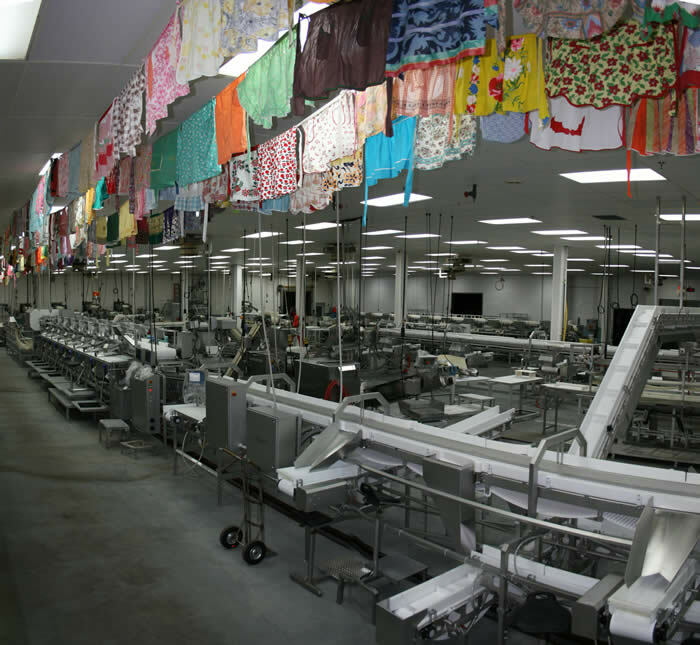 It includes portraits of workers, “data-mapping” to make visible their labor through story and statistics, as well as transient installations in the work site itself. 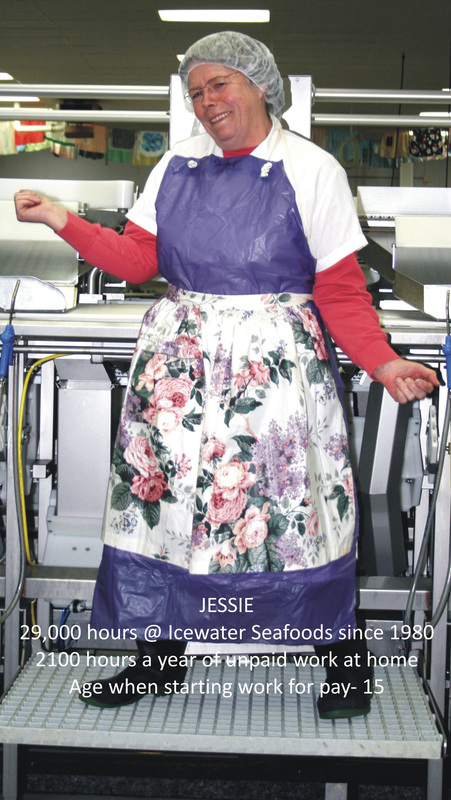 Documentation and “interpretative” works arising from the process are intended to be installed in the workplace – with workers themselves as first audience to their own participation in the project. 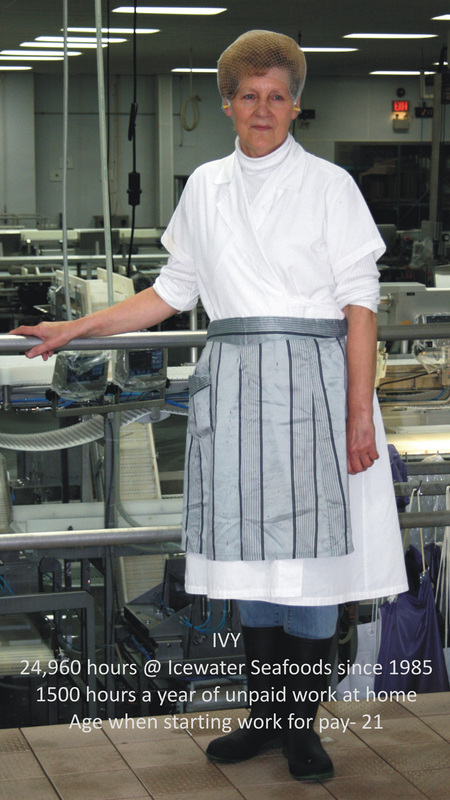 In 2008, Hall began work with women in the modern fish processing sector, exploring Icewater Seafoods in Arnold’s Cove, where the most recent version of the project was recently installed documenting the work of 73 individual women through worker’s portraits and a data map entitled “Preliminary Findings…” The project will continue to expand over time to mark women’s work in health care, food harvesting and creation, and a variety of industrial settings, both in Canada and the U.S. Scroll down to follow its progress. 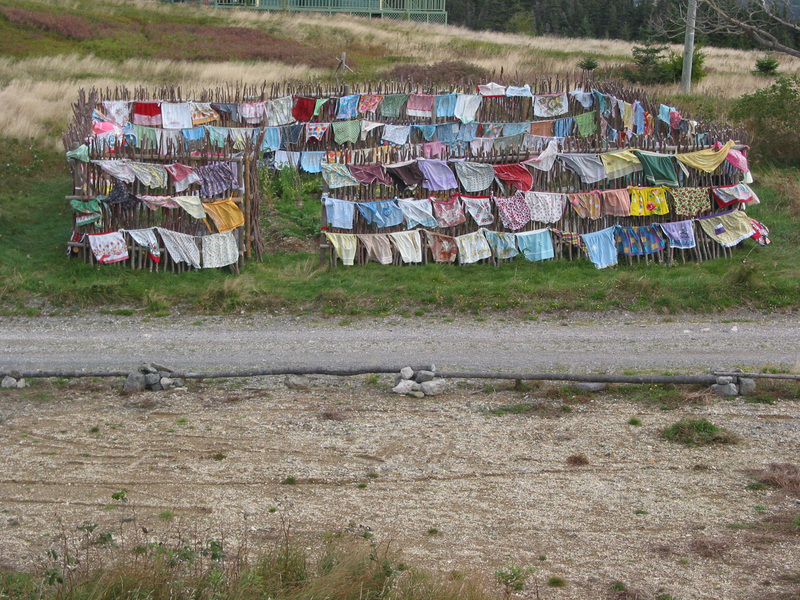 Historically, in Newfoundland, women “made fish”- working on fish flakes to turn and care for drying salt cod. 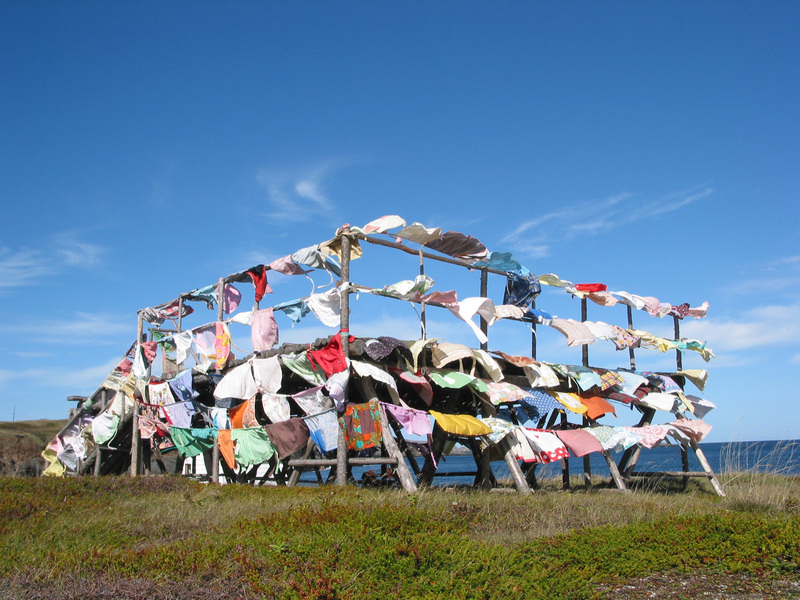 Below are selected images from the fish flake at Cape Bonavista, and Maberly. 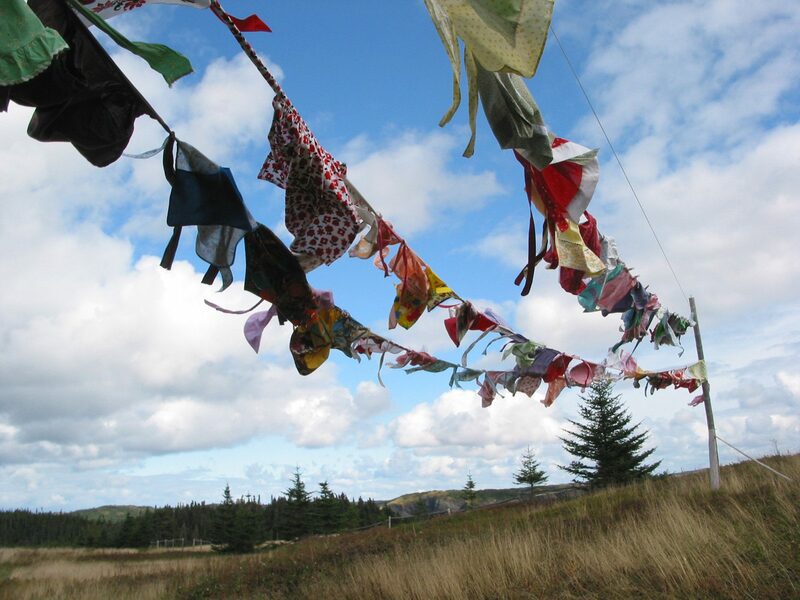 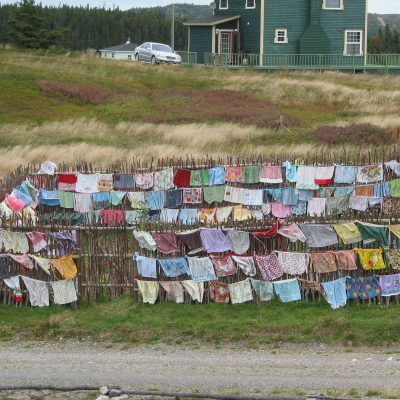 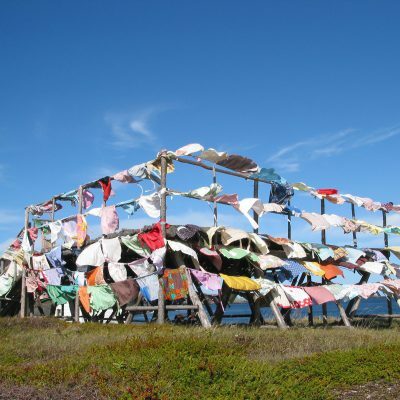 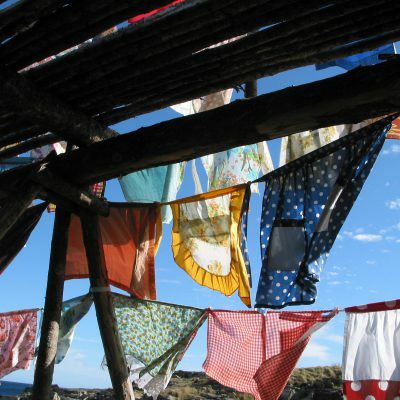 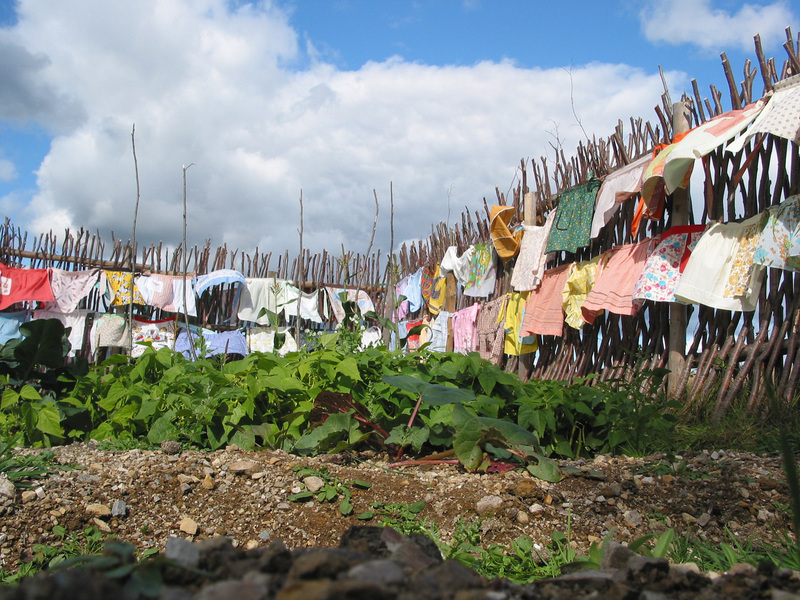 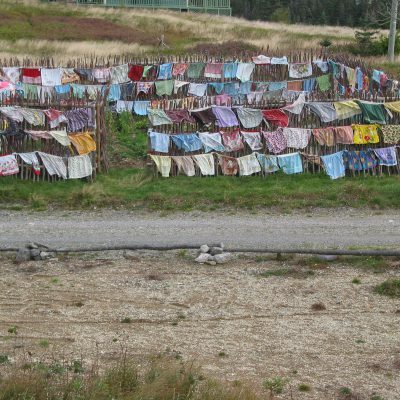 From the first clothesline installation at Port Rexton, Trinity Bay. 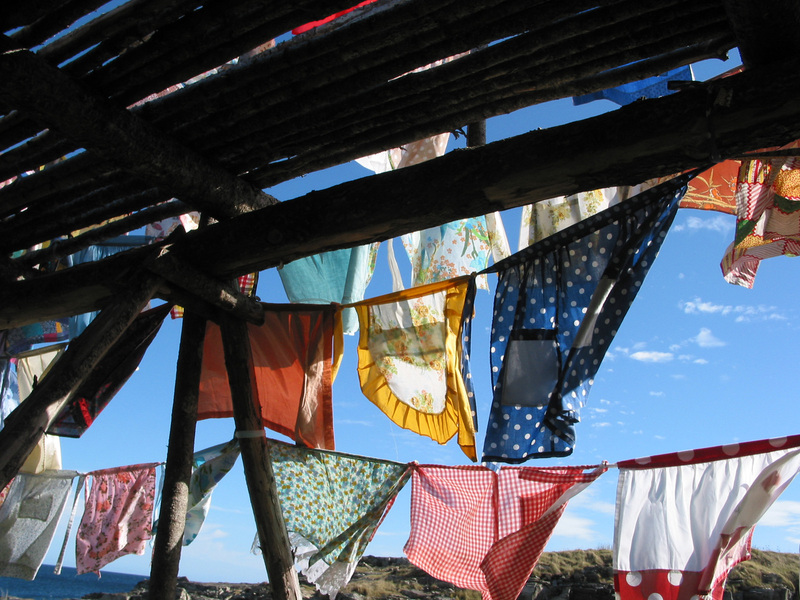 From the first “house” installation at Port Rexton, Newfoundland. 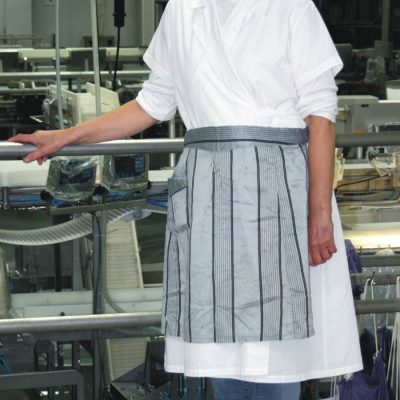 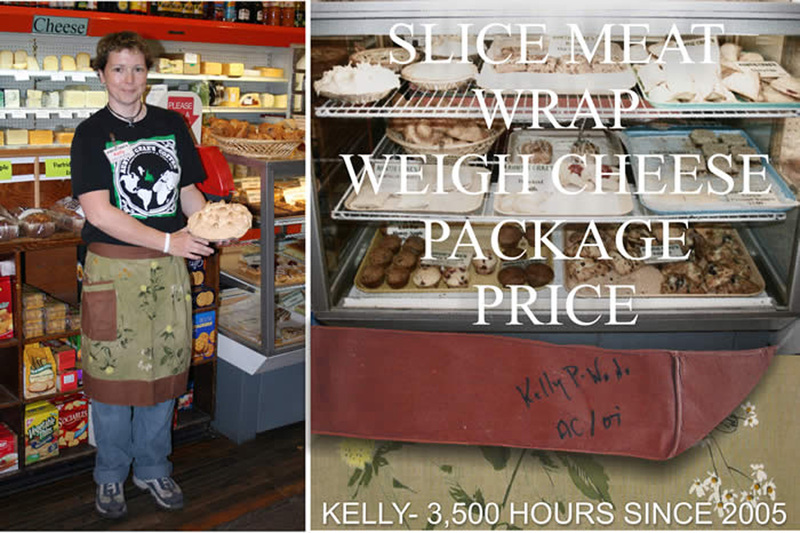 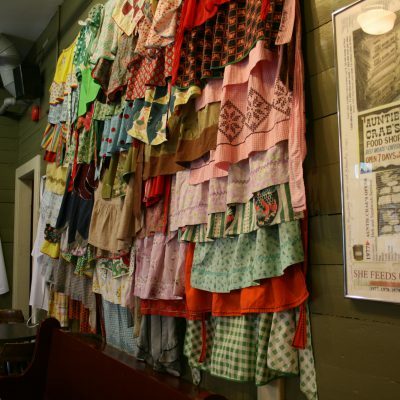 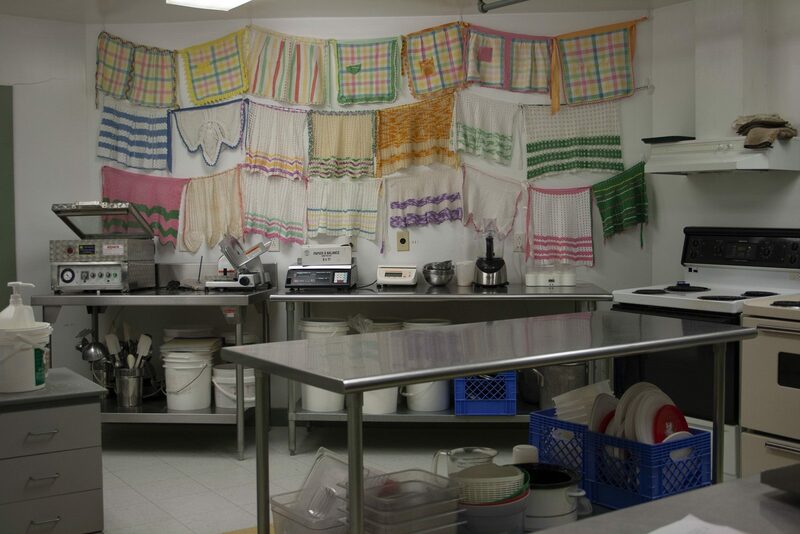 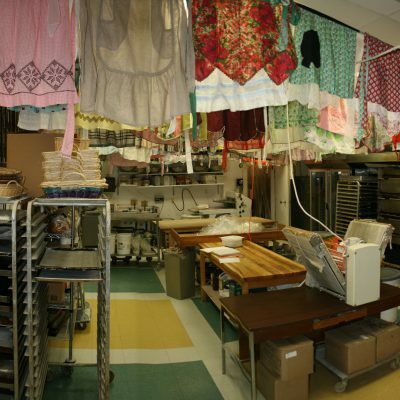 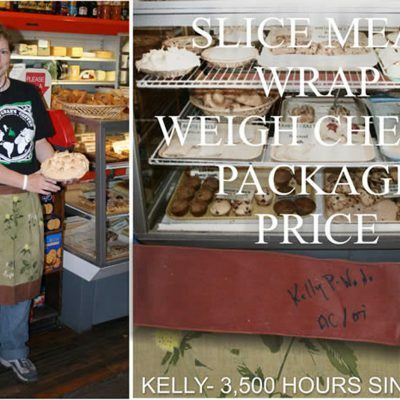 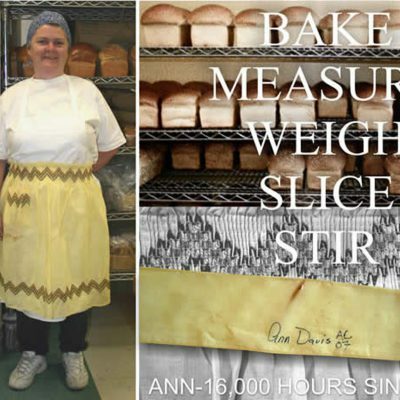 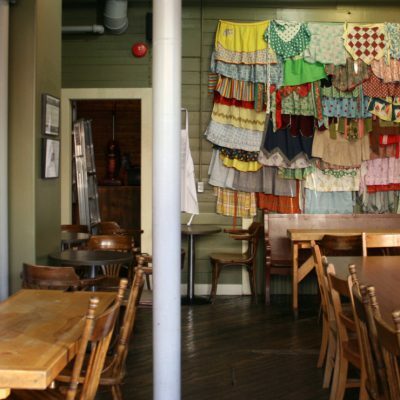 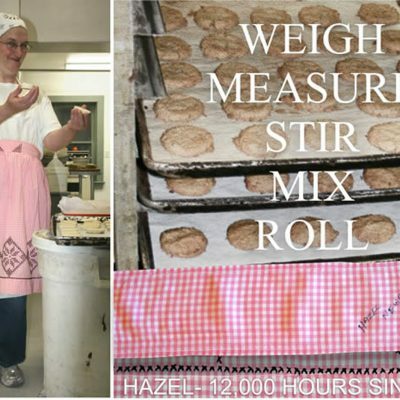 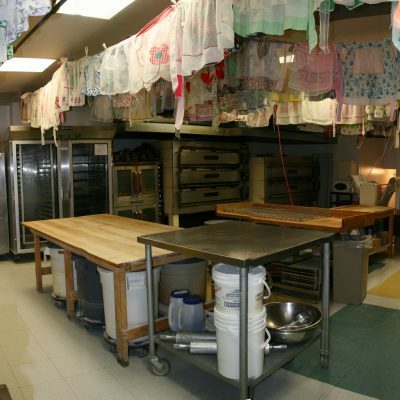 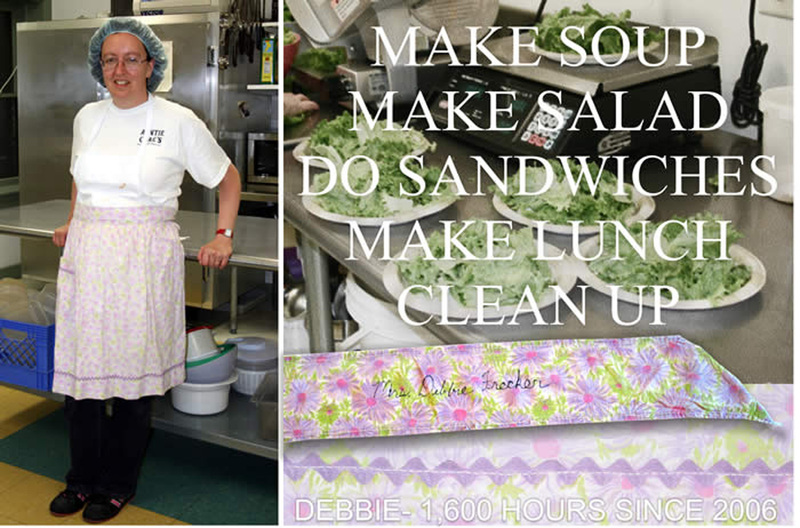 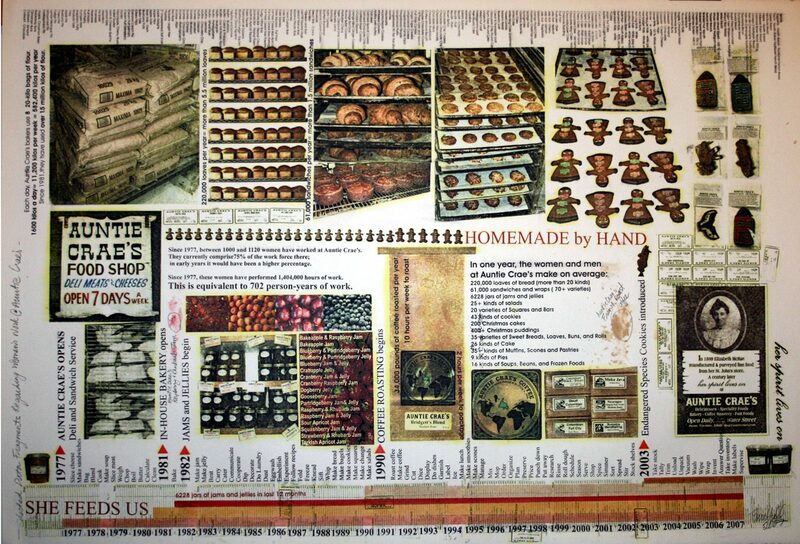 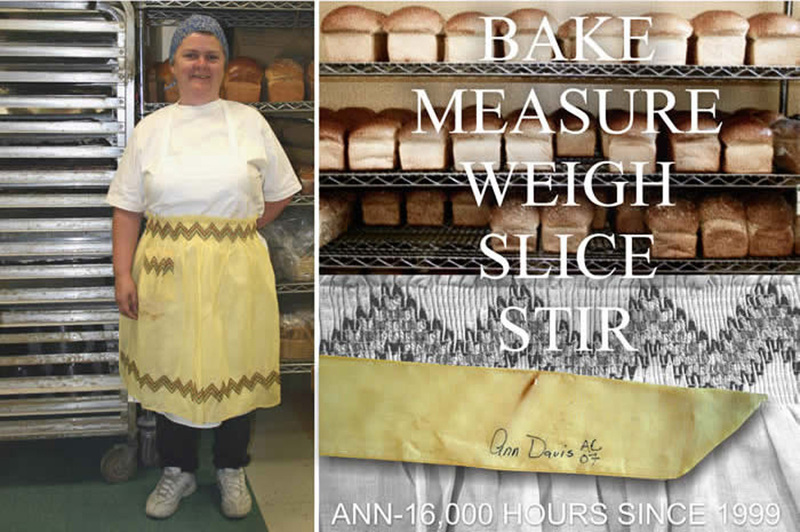 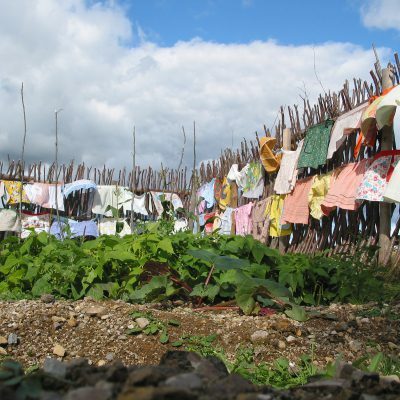 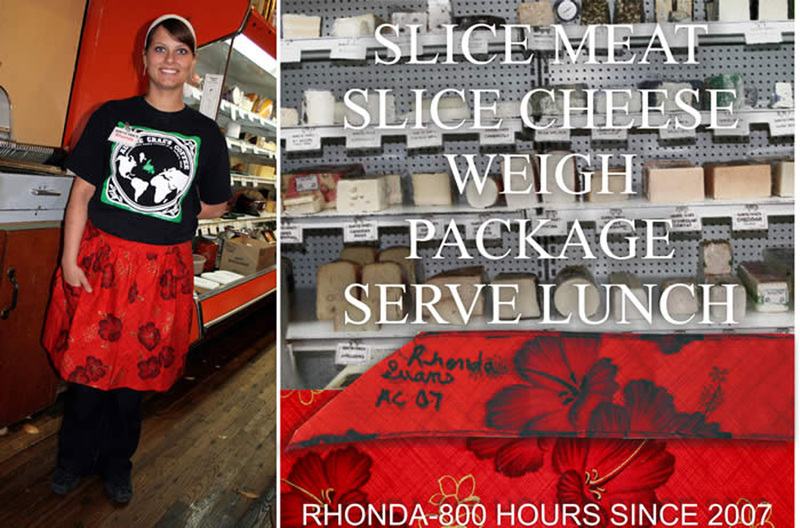 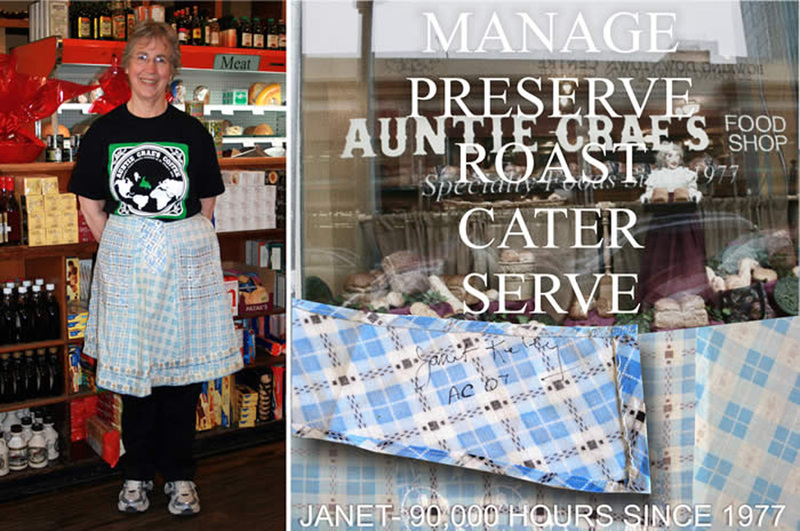 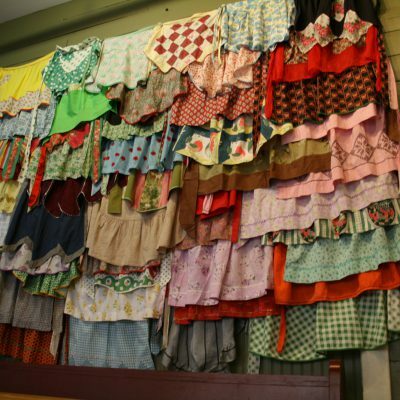 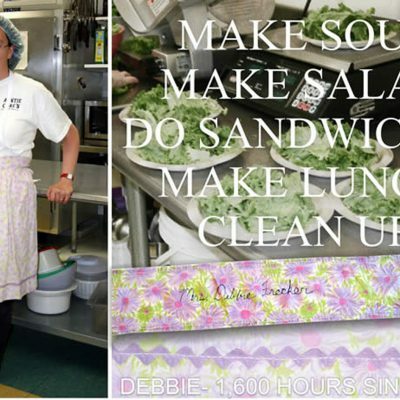 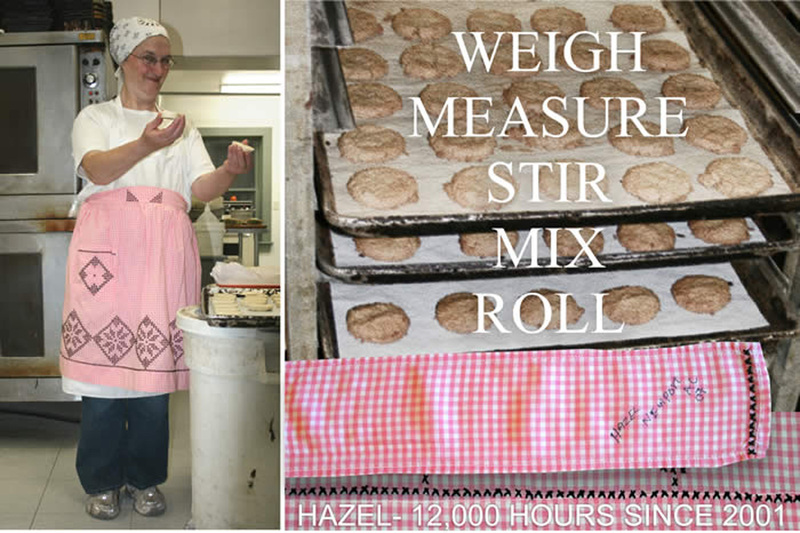 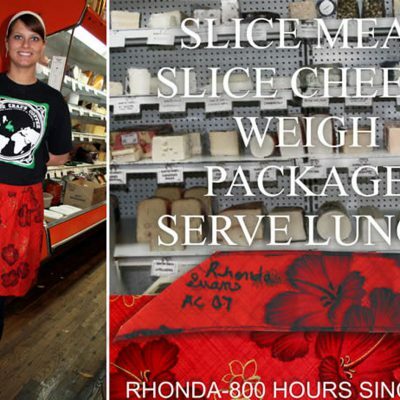 In the fall of 2007, Hall installed almost 200 aprons in the bakery and kitchen at Auntie Crae’s – a specialty food shop founded and owned by Janet Kelly, in St. John’s, Newfoundland. 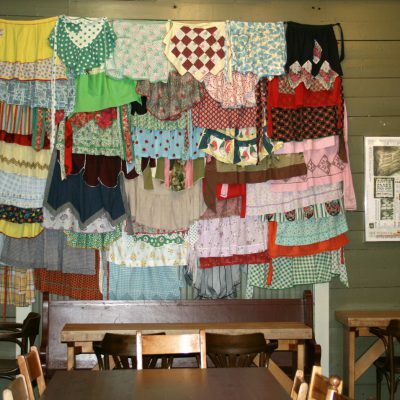 She made portraits of 18 of the 30 staff members, began collecting their work stories, and gathered information which she transformed into a “data map” – making visible various elements of the women’s work that represents over 700 person-years of labour in this enterprise. 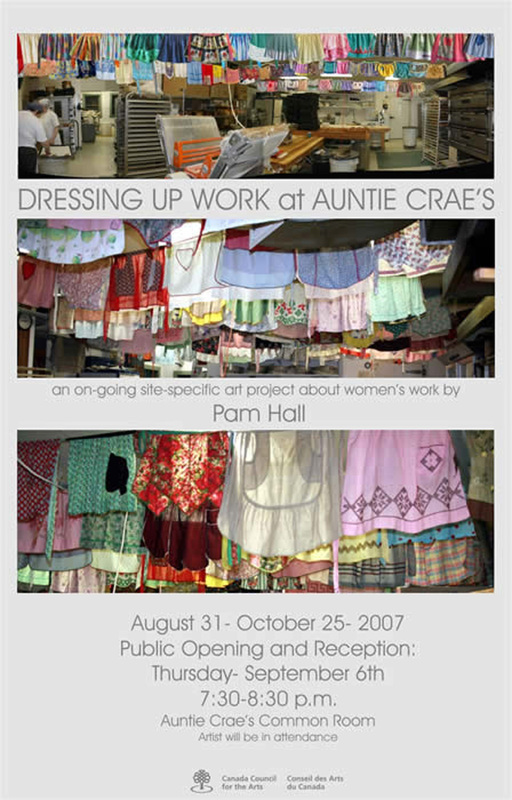 The selected images below document some of the work she created to share with the workers of Auntie Crae’s through a site-specific installation in the Common Room there. 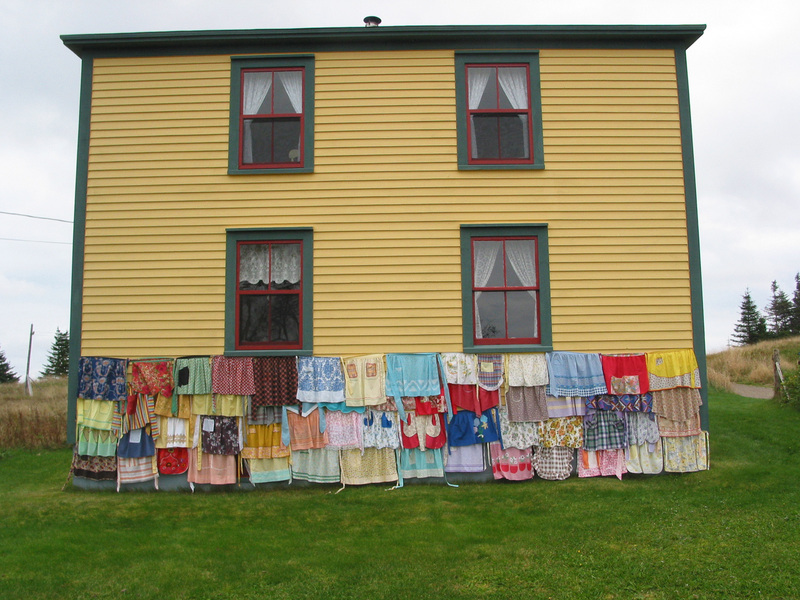 Accessible to the public, this work remained in place from August 31 – October 25, 2007. 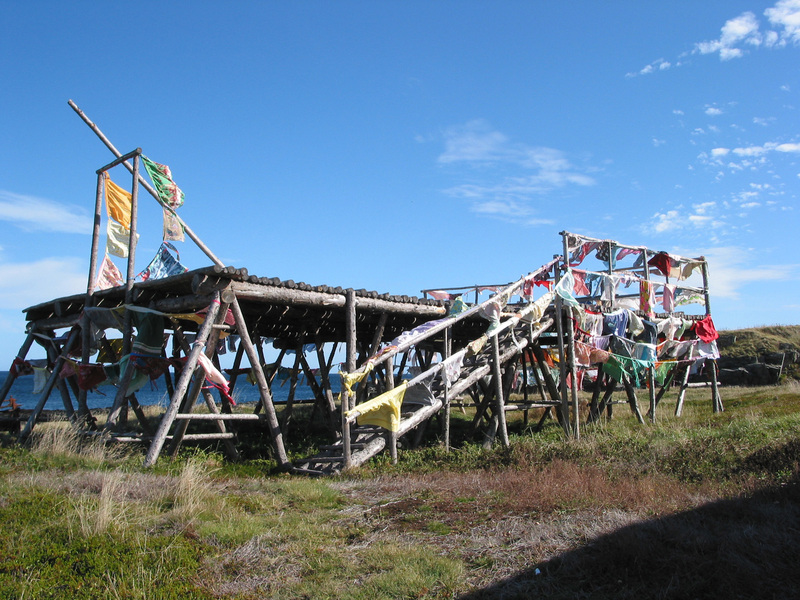 For project support in 2007, the artist gratefully acknowledges The Canada Council for the Arts. 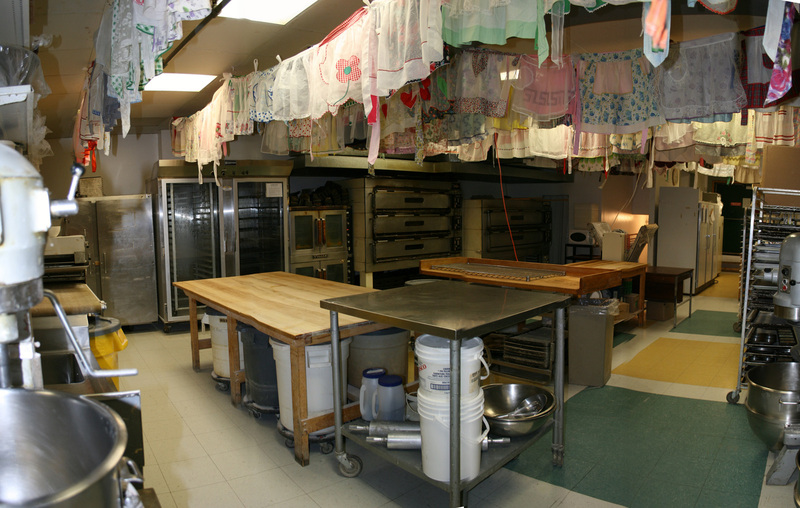 View from the entrance of the Common Room with the “data map” on the far right. 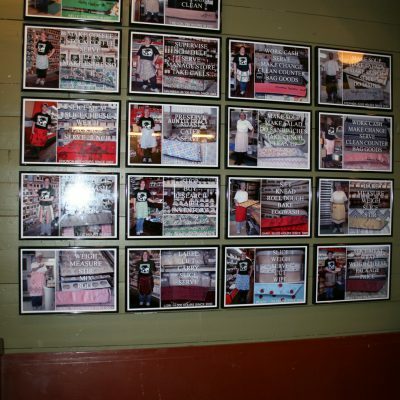 18 portraits of staff representing almost 280,000 person hours of work. 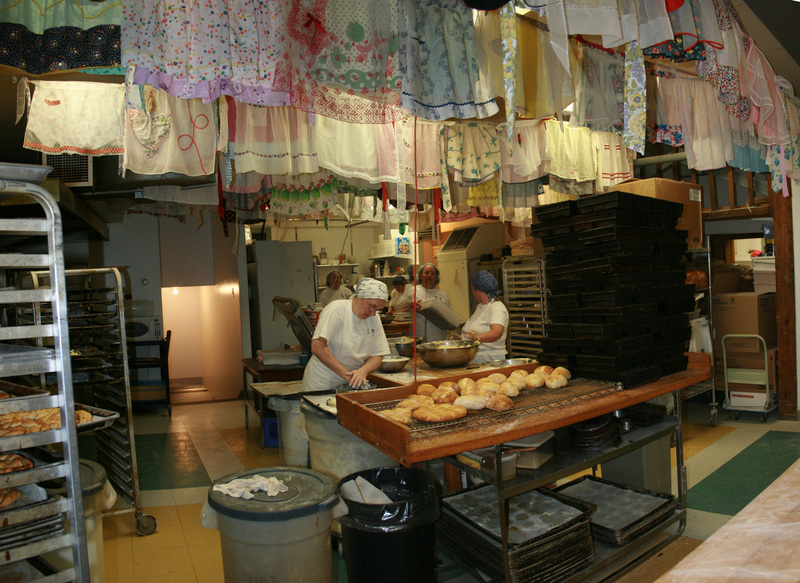 Hands-at-work in the bakery and kitchen. 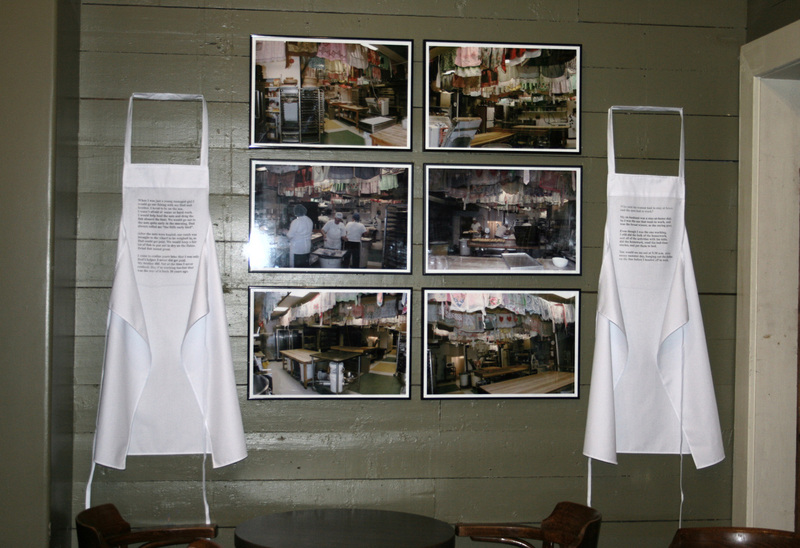 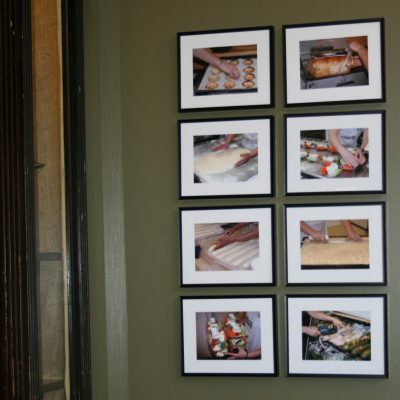 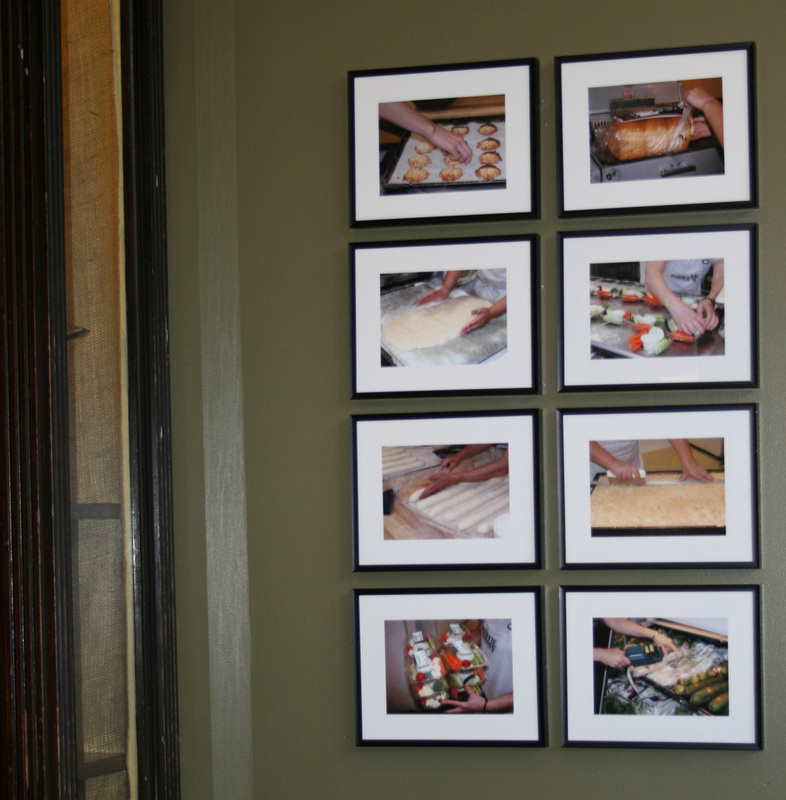 Photographs of the apron installation in the bakery and 2 “story aprons”. 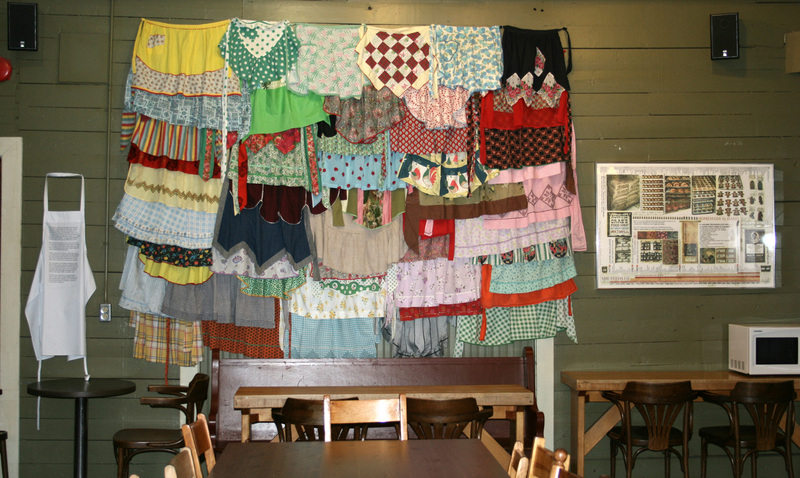 Detail of a “story apron”. 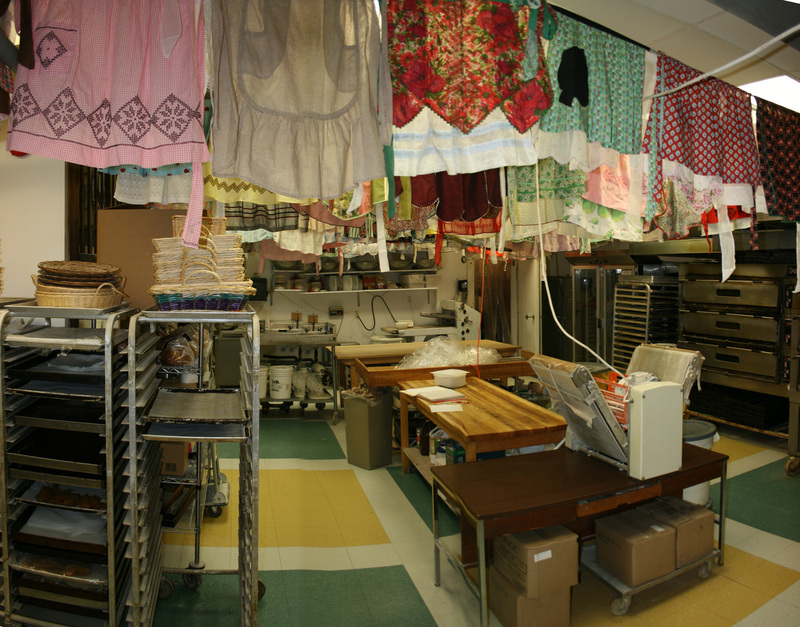 51 aprons from the bakery installation and staff portraits. 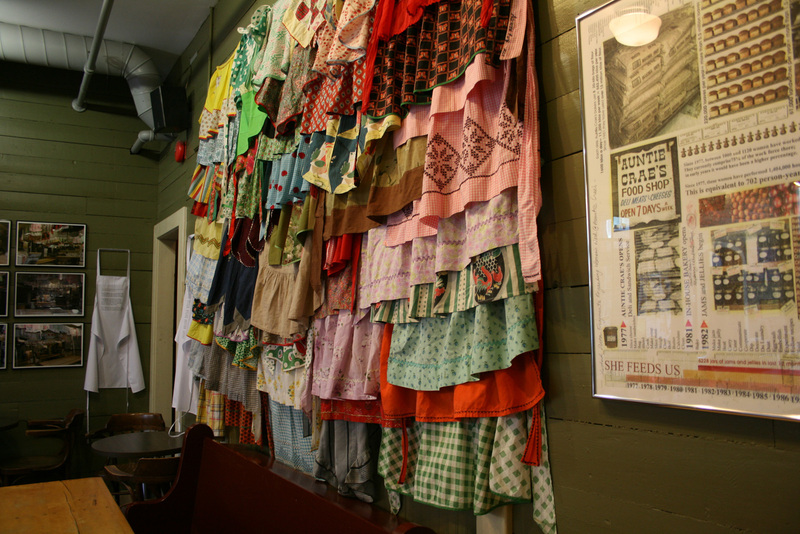 The back wall with “story apron”, aprons and the data map. 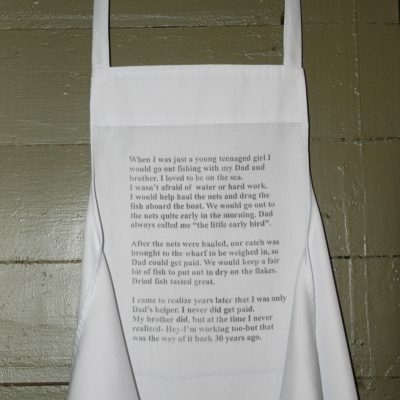 Hall has been working most recently to document and celebrate the work of women at Icewater Seafoods in Arnold’s Cove, NL – an almost 30-year-old fish processing plant. 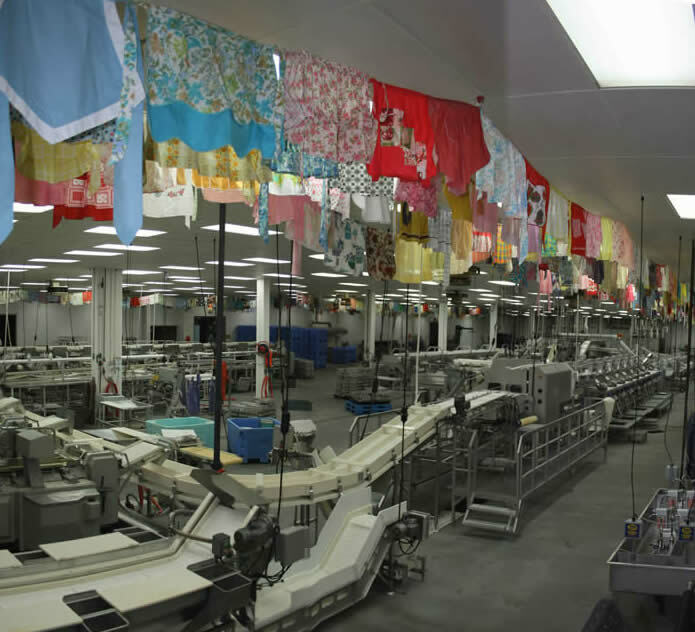 With the installation of almost 800 aprons completed in 2008, and more than 70 portraits of workers researched abd created, Hall has taken the completed work back to the plant and installed it for its primary audience – the workers themselves. 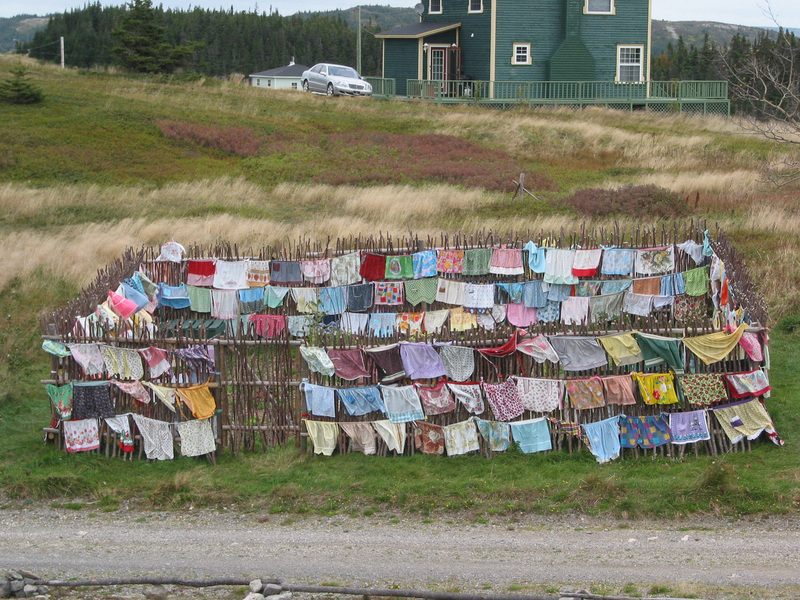 For project support in 2007, the artist gratefully acknowledges The Canada Council for the Arts, and in 2008, the Newfoundland and Labrador Arts Council. 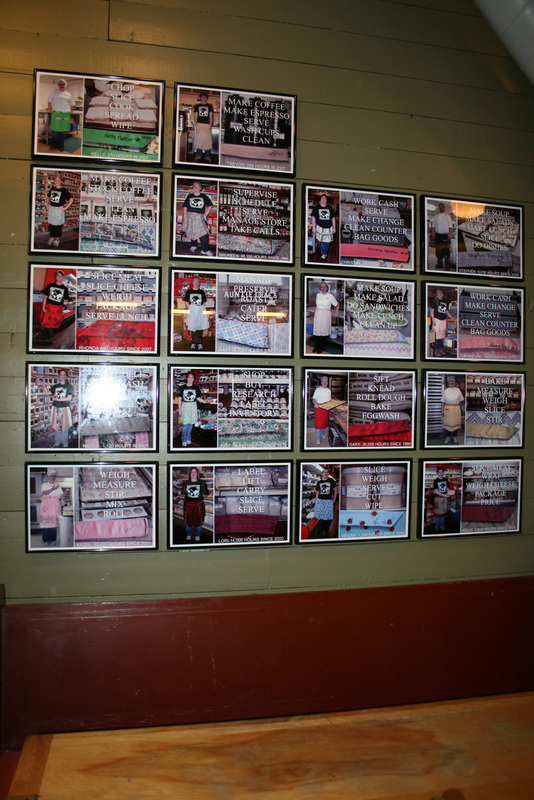 Most especially the artist is grateful for the support of the management and staff of Icewater Seafoods in Arnold’s Cove. 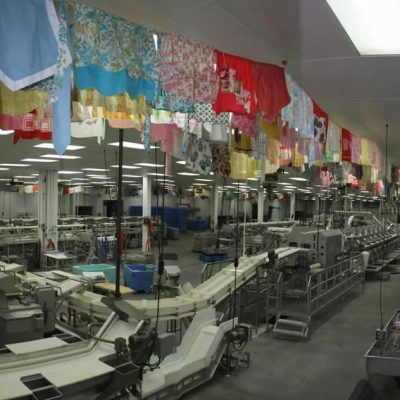 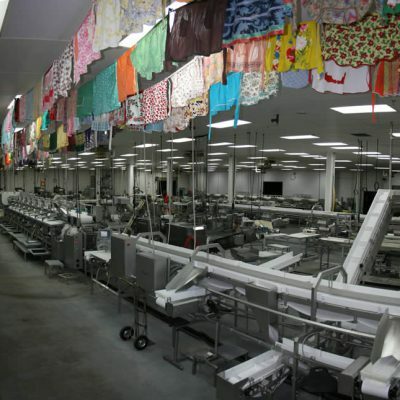 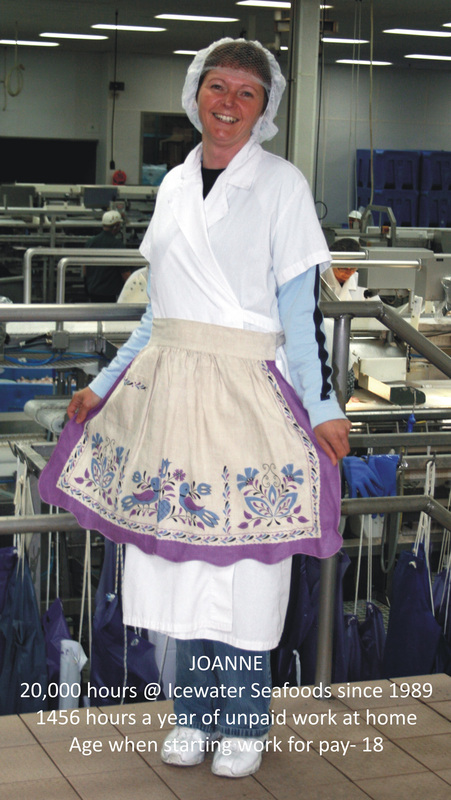 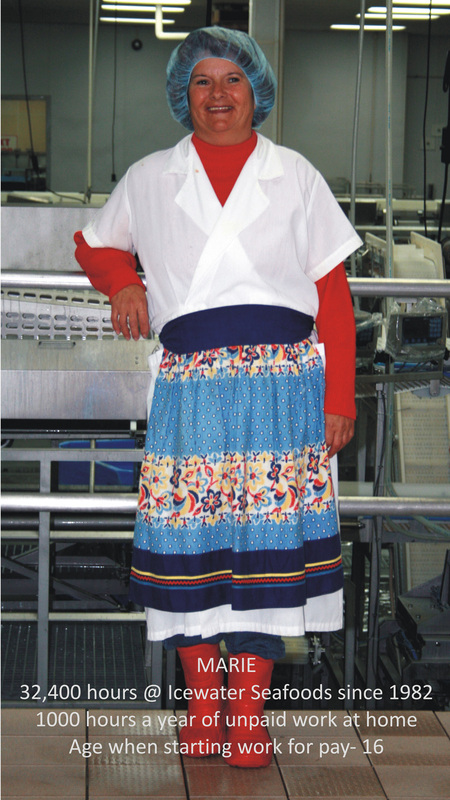 Over 800 aprons installed in the processing facilities at the plant. 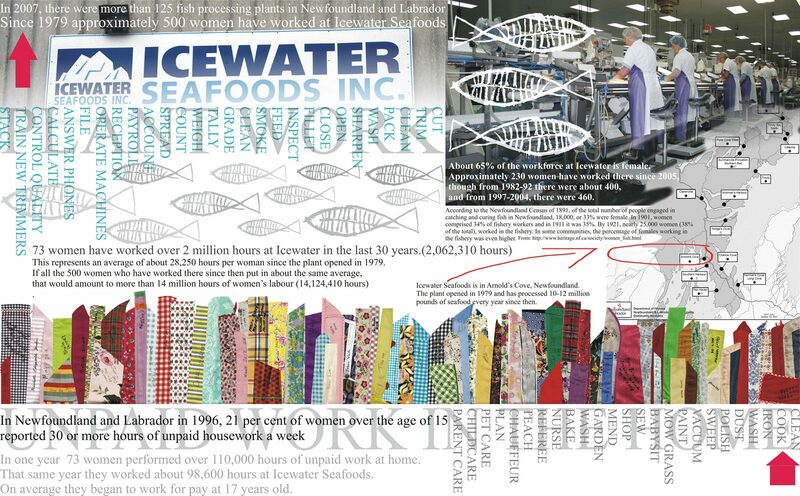 The first 13 participants / collaborators at Icewater Seafoods. 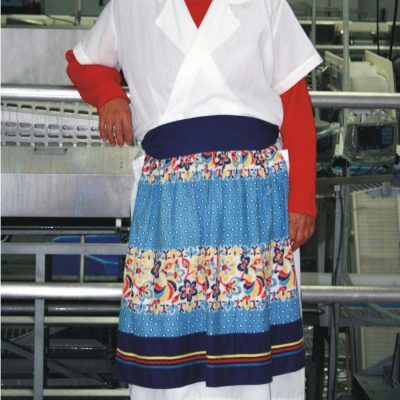 One of 73 individual worker’s portraits which together document over 2 million hours of women’s work at the plant since 1979. 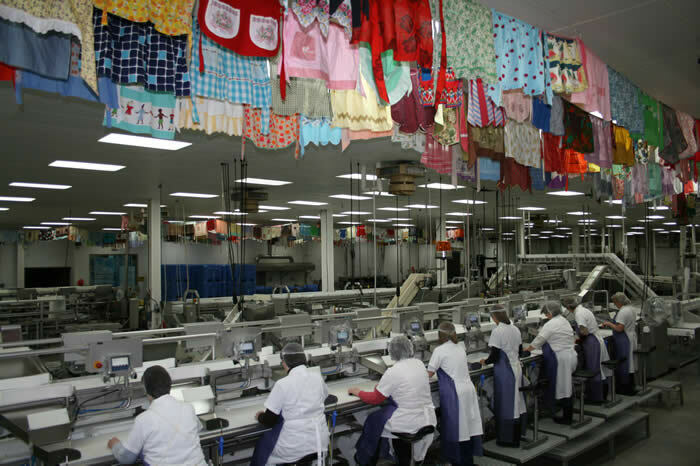 These 73 women represent only about 1/3 of the women working at Icewater. 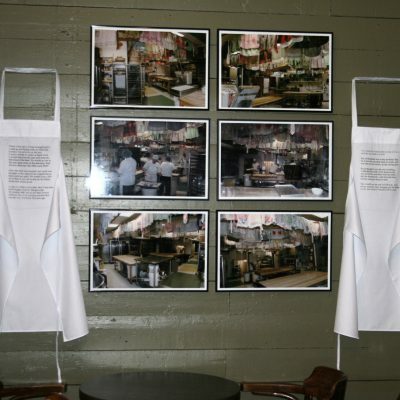 Finished work installed in the lunchroom at Icewater Seafoods: 73 11″×14″ portraits and the Preliminary Findings-Data Map. 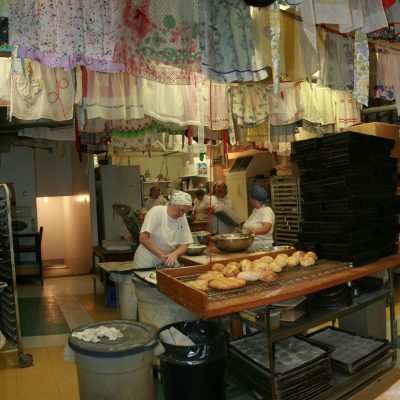 1988–1989. 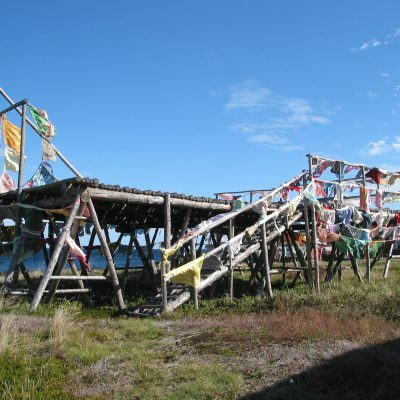 In the summer of 1988, Hall installed her first site-specific landwork as part of The International Sound Symposium.